Sometimes you’ve got it so rough that you don’t know if there’s anything that would bring you back to life. 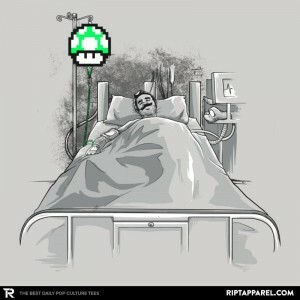 You’ve been touched by goombas, burned by lava, bitten by turtles and there’s nothing more you want than to lay in your bed and sleep the pain away. That’s where the 1UP mushroom comes in to rejuvenate you and give you just the pick-me-up you need to go back to hunting down King Koopa. Wrap this cloth around your torso to signal to others that you need your mushroom fix.